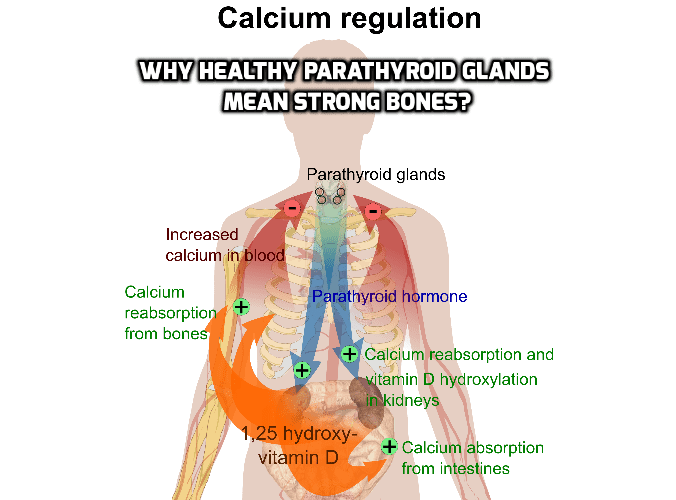 Is there Link between Strong Bones and Healthy Parathyroid Glands? If you have hypothyroidism and are worried about your bone health, or have been told you have osteoporosis you will definitely want to read this article to find out why healthy parathyroid glands keep your bones strong. The parathyroid glands are endocrine organs. They play an important role in the body’s complex hormone system to keep you fit and well. ‘Para’ means near, or next to which explains the name given to these four glands that are attached to the rear of the thyroid. In fact, the tiny parathyroid glands are so closely situated to the thyroid that they share the same blood supply. Although the parathyroid and thyroid glands have similar sounding names each gland produces different hormones, each with their own specific functions. When it comes to bone health, the most fundamental nutrient is calcium. This mineral plays a critical role to safeguard against osteoporosis, which leads to weak and fragile bones. The bones are a vast reservoir for calcium as it is an essential building block to maintain healthy bone structure. The parathyroid glands keep your bones strong by ensuring your body gets the calcium it needs to maintain bone strength. Optimal calcium balance is also crucial for muscle function and healthy nervous system activity. As you may already know, bone is a dynamic, living tissue. Healthy parathyroid gland activity supports the normal process of bone breakdown and bone building. Steady and balanced bone turnover is a normal process that benefits lifelong bone health. To help regulate levels of calcium the parathyroid glands make ‘parathyroid hormone’. This hormone is often termed a calcium-regulating hormone. When blood calcium levels drop extra parathyroid hormone is released into the bloodstream. This draws calcium from the bones and stimulates greater uptake of calcium by the kidneys. The net effect is an increase of calcium in the blood. When blood calcium levels get too high the parathyroid glands respond swiftly by reducing parathyroid hormone production. This keeps calcium stored in the bone and puts a halt to bone breakdown. The thyroid plays an important role in building bone health by producing a plentiful supply of calcitonin. This thyroid hormone is also termed a calcium-regulating hormone as it helps block excessive bone breakdown. When blood calcium levels rise, the thyroid releases greater amounts of calcitonin to bring blood calcium levels back down to normal. Parathyroid hormone and calcitonin work in sync to regulate calcium balance. By having two hormones with opposing actions, the body can closely regulate calcium concentrations. The link between vitamin D and healthy bones was made many years ago when it was realised that sunlight, or taking cod liver oil boosted vitamin D which in turn helped prevent a soft bone disorder in children called rickets. Today, vitamin D is seen as vital for overall health and strong bones. Calcitriol is a calcium-regulating hormone produced from vitamin D. When blood calcium levels drop, parathyroid hormone triggers the kidneys to make greater amounts of this active form of vitamin D. Calcitriol increases blood calcium levels by increasing absorption of calcium from the digestive system. A drop in vitamin D is associated with higher production of parathyroid hormone. This has the potential to increase bone loss. Maintaining optimal vitamin D can therefore have a protective effect to guard against excessive bone turnover. How do you check parathyroid health? If you are worried about your bone health or have been told you have osteoporosis it is a great idea to check your parathyroid health. A blood test that specifically measures parathyroid hormone levels is the main way to diagnose a problem. Medical practitioners and pathology labs routinely abbreviate the words parathyroid hormone to ‘PTH’. The PTH test is usually done along with a check of blood calcium levels. Problems can occur if the parathyroid glands are either producing too much or too little parathyroid hormone. Hypoparathyroidism is characterised by low levels of parathyroid hormone. On the other hand, when the parathyroid glands are overactive these glands produce an inappropriately high amount of parathyroid hormone. When parathyroid hormone levels are high the rate at which bone is lost exceeds the rate at which new bone is being formed. This leads to bones becoming weak and susceptible to fractures. This is the reason hyperparathyroidism is linked to the development of osteoporosis. The parathyroid glands are tiny and are normally only the size of a grain of rice. This makes visual identification of a problem tricky. Your medical practitioner may request a scan to help diagnose a problem with one or more of the parathyroid glands. A bone density test may also be performed to assess bone health. The 25-hydroxycholecalciferol, or 25OHD blood test is the most accurate way to measure how much active vitamin D is in the body. Are environmental toxins also taking a toll on parathyroid health? Like or not we are exposed to a wide range of environmental toxins in the air we breathe, the food we eat and the water we drink. As mentioned above the thyroid and parathyroid glands share the same blood supply. Further, there is a high volume of blood washing through these glands. This can make these glands susceptible to the damaging effects of environmental toxins or other harmful compounds that may be circulating in the blood supply. What Are Parathyroid Glands? How Calcium is Controlled. How to Keep Your Bones Healthy? That’s way more clever than I was exgneticp. Thanks! Many may think we are all crazy with all that we give up to have kids. And all the horrible thing we go through like pregnancy, child birth, terrible twos, no longer quiet nights at home, romantic getaways at a drop of a hat. Sure we give up a lot, but we get so much more in return. These kids make us better. They make life complete. This book sounds like quite an interesting read. I'd love to check it out. Previous PostPrevious Why Vitamin D is needed for a Healthy Thyroid? Next PostNext Which Hormone Controls Thyroid Hormones Production?